I don't drink. It's not that I'm being sanctimonious. It's that I don't like the taste of any alcohol I've ever tasted (mixed with sugary stuff to make it palatable to my sweet tooth is a different story) and there are alcoholics in my extended family. Given my own pretty transparently addictive personality, I've never felt like developing a taste for alcohol was a good idea for me. But that doesn't mean I'm not curious about alcoholism through the years, the changing perceptions of alcoholics, and the history and development of treatments for those suffering from it. 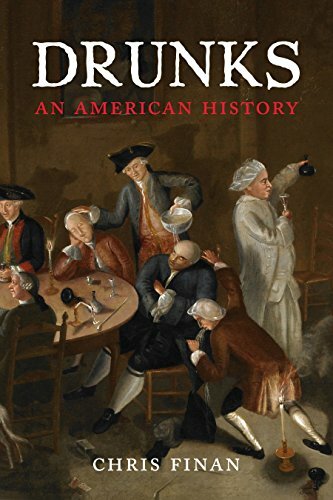 Christopher Finan's forthcoming book, Drunks: An American History, is an examination of just those things. Starting with Handsome Lake, a Native American man who lived in the late 1700s and early 1800s, Finan traces the many unrelated, and nowadays unknown, movements meant to help alcoholics overcome their addiction throughout American history. We all know Alcoholics Anonymous today but there were many forerunners to AA, all of which boasted varying degrees of success. Each of the movements had a similar goal, the reform and cure of alcoholics, but they went about achieving that goal in different ways and with different degrees of support from society and the medical establishment at the time. The stigma of alcoholism, the debate over whether it is a disease or not, and the rise and fall of programs to help alcoholics (indeed, even the varying opinions on whether they could/can indeed be cured) are all covered in detail here. Finan covers famous people and events in the fight against drinking (Carrie Nation, Prohibition) but he also covers those less well known who were leaders in the fight to help alcoholics get sober. The book is organized chronologically and Finan grounds each organization's founding, existence, and eventual decline in the larger society and times that allowed for its formation. He's done extensive research, quoting both primary and secondary sources. The work can be a little dense and the differences between the movements aren't always completely obvious. But those minor differences could be the one thing that helped a drunk get dry so they were very important indeed. This is not an easy, quick narrative non-fiction read but it will undoubtedly be invaluable to those with an interest in addiction and the long, still ongoing, quest for sobriety as well as those curious about the changing attitudes towards alcoholism (moral failing? illness? disease?). I heard about this book last month and I'm glad to hear it's good! On my list.